PEARLAND — The Greater Houston Volleyball Coaches Association hosted their annual All-Star games featuring some of the Houston area's volleyball stars. Dawson, Friendswood, and Pearland had players that were selected to play in the games. Dawson featured OH Jordyn Sinnette, setter Sarah Kirk, and Libero Marisabel Torres. Marisabel Torres, recipient of the "Heart of a Champion Award." 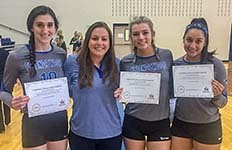 Representing Friendswood was head coach Sarah Paulk who coached the East Team, RS Faith Marabella, setter Kylie Lockhart, setter Zeyanna Dhalla, and MB KcKenna Fridye. 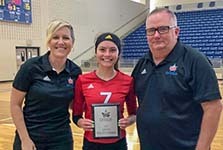 Pearland was represented by Libero Meagan Keasler. 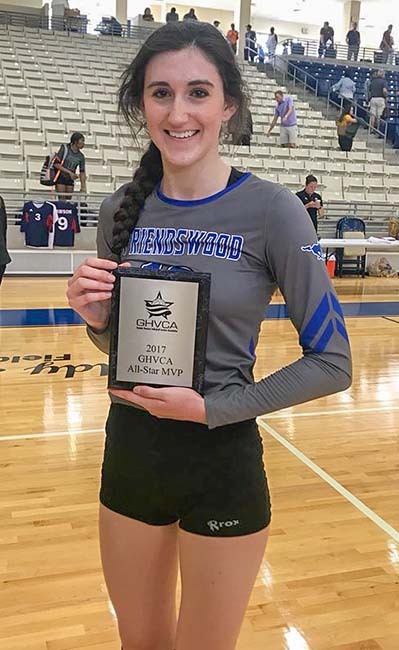 Congratulations goes to Friendswood's McKenna Fridye who was named MVP of the tournament. Friendswood's Kylie Lockhart received the $500 Susan Contine Memorial Scholarship. Friendswood coach, Sarah Paulk, and players. Dawson's Marisabel Torres received the "Heart of a Champion" award.